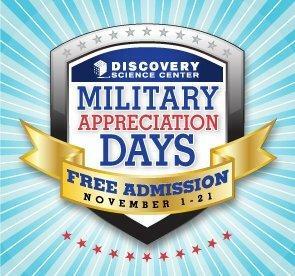 Discovery Science Center is honoring the men and women who have served our County with free admission on Veterans Day. All retired and current U.S. military men and women can take advantage of this special offer. The free general admission includes one additional adult for free, and any additional tickets (maximum of 6) can be purchased at the discounted price of $12 each.